Speed Ways: Through 3-phase output inverter and adjust the inverter frequency to change the spindle speed. Main Application: Engrave for wood,bamboo,normal PCB,PVC,PMMA,plastic,duotone board(ABS)and etc nonmetal, also can engrave on gold,silver,copper, aluminium,Pb etc soft metal surface working. Bearing is P4 grade,2×7008C P4 DB & 2x7004C P4 DT .The front-end bearings are ceramic ball bearings,increase the spindle life. 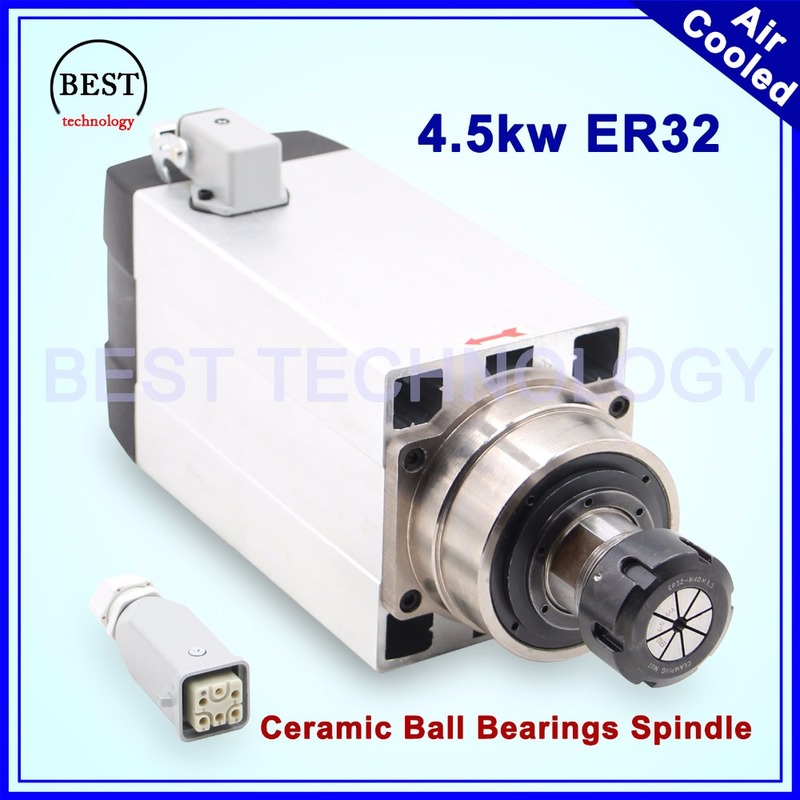 4.5kw ER32 air cooled spindle, the collet nut range from 1mm to 16mm, better than ER25 collet. Shipment within four days,there is no fake tracking number,make sure that you receive time. We are the spindle manufacturer,we offer only best quality and best price to you. High-speed electric main bearings used in all C class high-speed angular contact ball bearings, axial pre-load feature, improved support stiffness and live spindle grinding accuracy under high-speed rotation. Spindle speed according to different uses can be high-speed grease and oil mist lubrication two ways. Spindle speed rotation temperature rise caused by the use of coolant circulation system eliminated. Spindle working environment temperature is usually -10 ~ 40 . Before installing the first electric spindle axis head turned by hand, should feel flexible, non-blocking phenomenon. Spindle in the preservation and transportation, high-speed grease inside the bearing state will change, customers should be running at low speed for 30 minutes. 3000 rpm and then follow the poor increase, run 20 minutes each. Spindle and the inverter should be working together. The inverter's specifications and parameter settings need match spindles parameter. Connect the inverter spindle, three-phase inverter power cord should be soldered in the plug 1 (U), 2 (V), 3 (W) feet. After the power is turned on, to observe whether the spindle rotation axis indicates the direction consistent. If inconsistency should be immediately shut down, replace the inverter and spindle connected two wires of three-phase power supply. It should ensure that before use of water-cooled spindle, the cooling system is working properly. Every day before using the spindle must be running at low speed for 15-20 minutes. Clamping the cutters to spindle, collet nuts ,collets,cutters must be clean enough. Shank inserted into the collet must be greater than 15mm. Spindle frequency power supply connected rated voltage, frequency should be consistent with the technical parameters of the electro-spindle, spindle speed can be adjusted to change the frequency, and voltage is proportional to the change. Spindle being not used, the application of compressed air to blow the pipes static coolant.To prevent rust, clogging water holes. Spindle appearance should be oiled. Plus the shaft protection device, put in a dry place. To replace the spindle bearings, certain professional and technical personnel should be replaced.Supporting special tools, bearings should be replaced fully cleaned without removing the stator coils.